The exoskeleton is fully actuated and is powered by an electric motor. It’s got 22 degrees of freedom, many of which are in the enormous hands, which can grip, twist, and pull objects. These abilities are particularly helpful in disaster relief scenarios in which someone might be, for instance, clearing heavy debris. While the exoskeleton isn’t eligible for competitions such as the DARPA Robotics Challenge, given that it’s human-driven rather than software-driven, it seems to be able to perform many of the same functions. 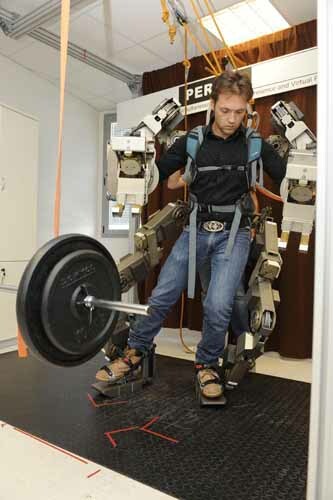 Perhaps most impressive is the exoskeleton’s ability to heft over 100 pounds in each hand — with its forearms extended. Someone should wear this thing to the gym! The Perceptual Robotics Laboratory (PERCRO) aims to develop technology that helps humans better navigate their environment. They’re working on exoskeletons, including ones that focus on specific body parts, such as exo-hands, vehicles, appliances, robots, and more, with a special focus on virtual environments and tele-robotic systems. This kind of integrative technology represents the increasing hybridization of man and machine. Even though this exoskeleton can be taken off, it still demonstrates collaborative possibilities that aren’t as far-fetched as those depicted in Pacific Rim, while also avoiding concerns that arise with the types of disaster relief robots featured in the DARPA Robotics Challenge, which some belief are too close to autonomy for comfort. The body extender exoskeleton seems to be a way for man to have his cake and eat it too, leveraging the power of robotic technology without having to worry about the robot getting any funny ideas. Plus, anyone who has seen Aliens would jump at the chance to pretend to be Ripley, even if only for a little while.